230 pages | 220 Color Illus. 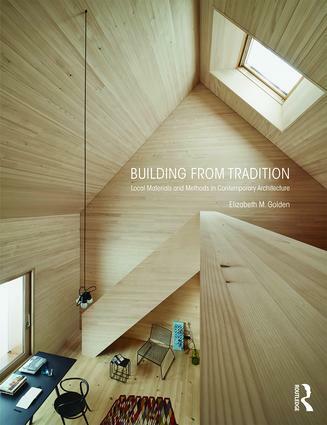 Building from Tradition examines the recent resurgence of interest in the handmade building and the use of local and renewable materials in contemporary construction. In the past, raw materials were shaped to provide shelter and to accommodate the cultural, social, and economic needs of individuals and communities. This is still true today as architects, engineers, and builders turn once again to local resources and methods, not simply for constructing buildings, but also as a strategy for supporting social engagement, sustainable development, and cultural continuity. • 24 detailed case studies examining the disadvantages and benefits to using traditional materials and methods and how they are currently being integrated with contemporary construction practices. Elizabeth M. Golden is a registered architect in the United States and in Germany. She has contributed her expertise to the design and construction of the Gohar Khatoon Girls’ School, the largest institution of its kind in Afghanistan, and to Niamey 2000, an urban housing proposal for the rapidly expanding capital of Niger. As an Assistant Professor in the Department of Architecture at the University of Washington, she teaches courses focused on design, materials, and building technology, with an emphasis on sustainable systems. She is also co-director of the Philippines Bamboo Workshop.